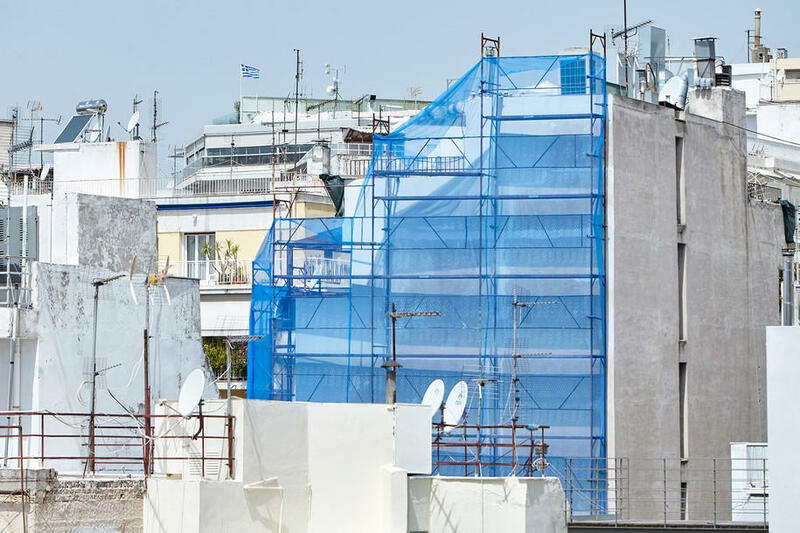 Athens has become the indisputable center of interest during these last years, art is no exception, and the-once-in-a-lifetime co-hosting of Documenta proves it. So, if you keep finding difficult to direct your foreign friends through the thriving cultural landscape of Athens, this is the solution. “Und. Athens is a new art-guide that seeks to map, record and promote the alternative art scene of Athens today. As such, the map focuses on art but also provides a lot of other useful information to visitors, including landmarks, transportation and main streets”, as its creators describe it. 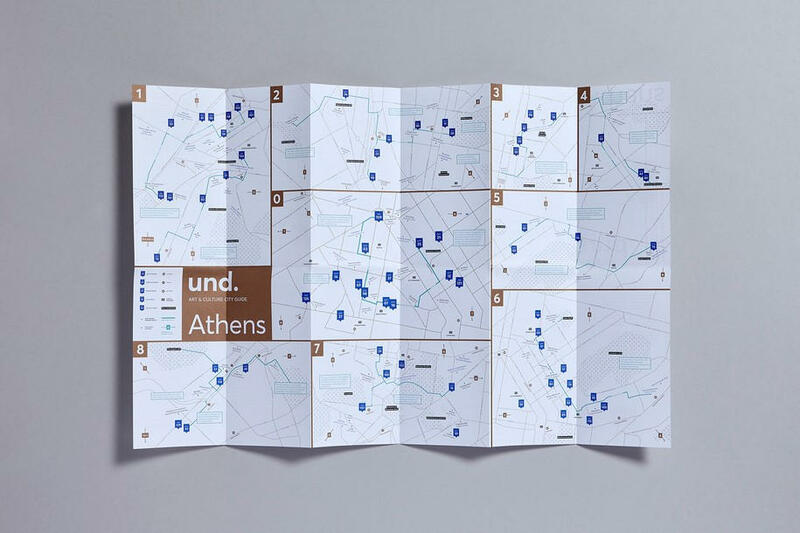 THE MAP DIVIDES THE CITY INTO NINE AREAS THAT CORRESPOND TO THE MAJOR ATHENIAN NEIGHBORHOODS, ORGANIZED ON A NON-SYMMETRICAL GRID THAT IS ALSO PRACTICAL TO FOLD. THE MAP ALSO PROVIDES A LOT OF OTHER USEFUL INFORMATION TO VISITORS, INCLUDING LANDMARKS, TRANSPORTATION, MAIN STREETS, ALL ORGANIZED IN A HIERARCHY AND RENDERED ACCORDINGLY USING COLOR AND TYPOGRAPHY. Founding Director and Publisher, Kiriakos Spirou, joined his forces with the mutliply awarded designer and und. Athens’ creative director, Natassa Pappa, to produce an explicit, yet alluring cultural narration. THE CLIENT’S BRIEF CALLED FOR AN ARCHIVAL/INDEX APPROACH, THEREFORE A FOCUS HAS BEEN PLACED ON LISTS AND LINEAR ELEMENTS. UND. 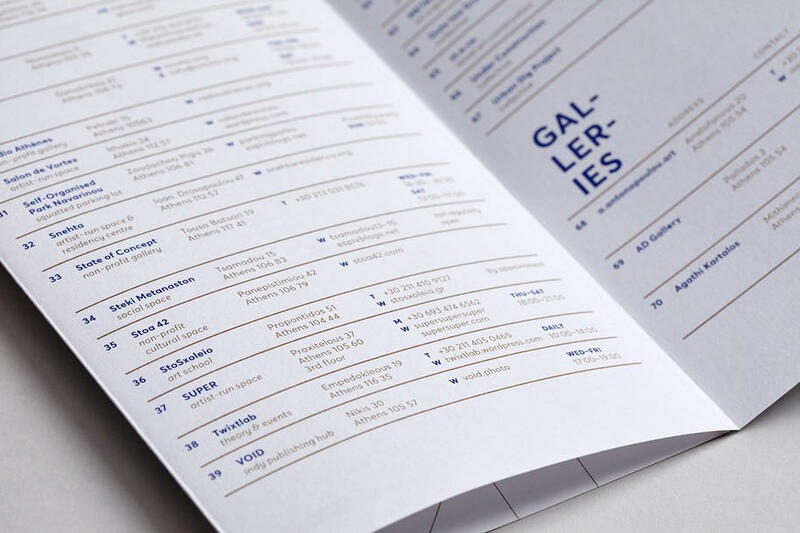 ATHENS IS A COMPREHENSIVE ART DIRECTORY FOR CONTEMPORARY ART IN ATHENS, DESIGNED WITH THE ART PROFESSIONAL, COLLECTOR AND JOURNALIST IN MIND. The designer explains that “the layers of information have been organized in a hierarchy and rendered accordingly using color and typography. The client’s brief called for an archival/index approach, therefore a focus has been placed on lists and linear elements. 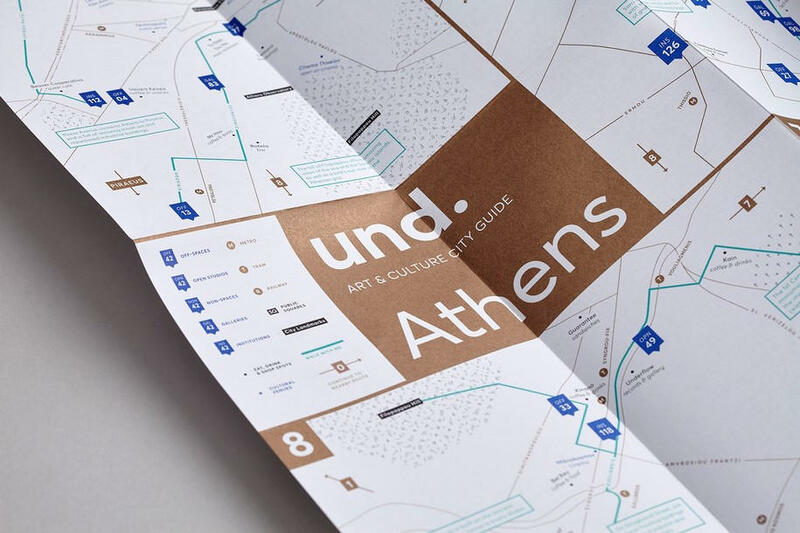 AS ONE OF EUROPE’S MOST RAPIDLY EMERGING ART HUBS, ATHENS DESERVED ITS OWN MODERN AND EASY-TO-USE ART GUIDE. UND. ATHENS ALSO WORKS AS AN INSIGHTFUL CITY GUIDE, THAT COMPLEMENTS YOUR ART WALK WITH SUGGESTIONS ABOUT WHERE TO EAT AND DRINK, AS WELL AS SNIPPETS OF CONTEXT THAT ONLY A LOCAL COULD TELL YOU. 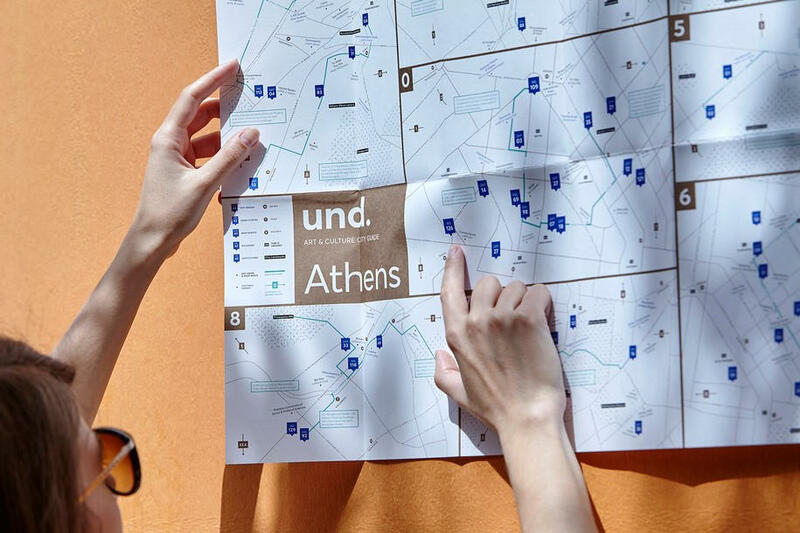 But how can one fit the physically and conceivably extended urban fabric of Athens in a printed map that you be easy to use and understand? This was resolved by dividing the city into nine areas that correspond to the major Athenian neighborhoods, organized on a non-symmetrical grid that is also practical to fold. The bronze grid also creates the brand’s visual identity, and as a concept it can be applied to different cities in the future. 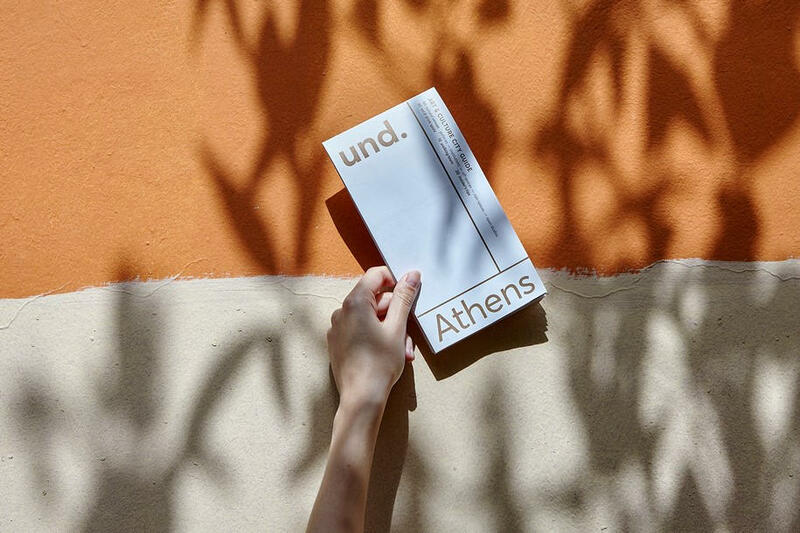 THE URBAN LANDSCAPE AND COLOUR PALETTE OF CONTEMPORARY ATHENS WAS THE INSPIRATION BEHIND SEVERAL DESIGN ASPECTS OF UND. ATHENS. DESIGNER NATASSA PAPPA & FOUNDING EDITOR KIRIAKOS SPIROU TAKE THE MAP ON A TEST DRIVE. Natassa Pappa is a creative director. Her work focuses mainly on using the city as a source or as a medium, to create narratives and experiences through graphic design. 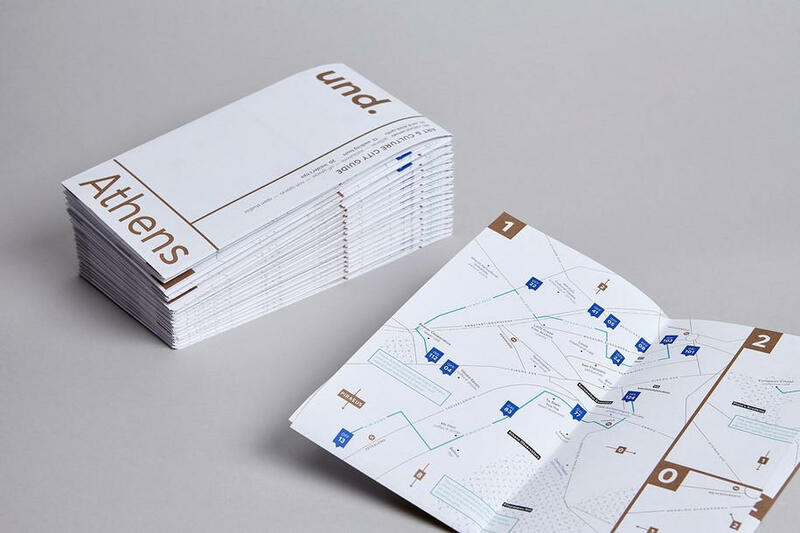 With a conceptual approach, she opts for content-focused and research driven design that seeks editorial conversation, ranging from print to spatial across a mixed clientéle. 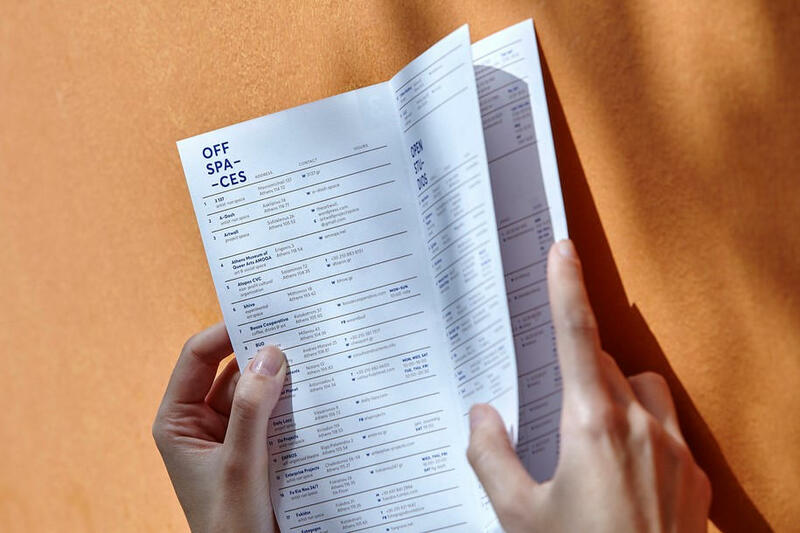 Currently based in Athens, she expands her design spectrum through walking lectures –like “Athens Walkthrough”– and urban research workshops. Kiriakos Spirou is a Cypriot art writer, editor and curator based between Cyprus and Athens. His work involves mapping and documenting alternative and emerging art from Greece and the Eastern Mediterranean, and he is also active as a cultural facilitator and curator in Greece and Cyprus. His writings have been published in Dapper Dan magazine, O Fileleftheros newspaper, Yatzer.com, Epitome.xyz, The Forumist, Dust magazine, as well as in exhibition catalogues in several European countries. He is the publisher and founding editor of und. 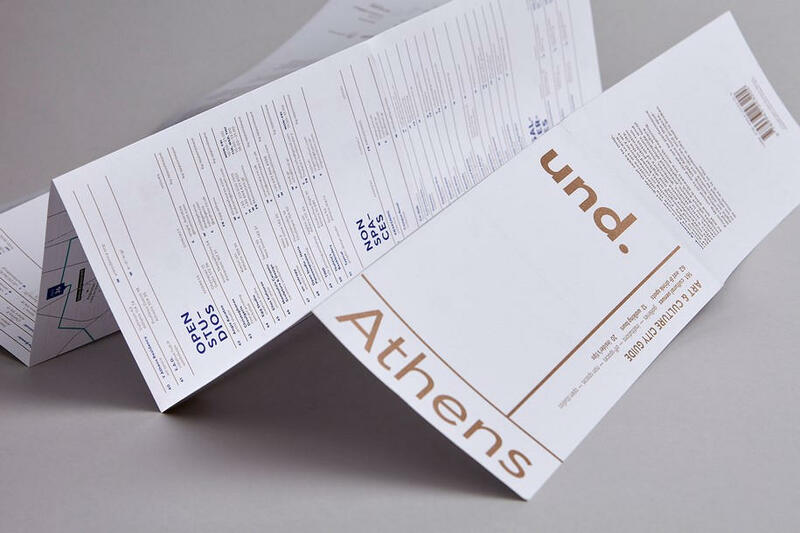 Athens, a new contemporary art guide for Athens.